On the morning of 17th January 2017, seven months after the EU Referendum, Prime Minister Theresa May said at Lancaster House “We will pursue a bold and ambitious free trade agreement with the European Union. Recognising what continued membership of the Single Market and Customs Union after Brexit would mean, she went on to say it “would mean complying with the EU’s rules and regulations that implement those freedoms, without having a vote on what those rules and regulations are. It would mean accepting a role for the European Court of Justice that would see it still having direct legal authority in our country. It would to all intents and purposes mean not leaving the EU at all”. Words echoed recently by Dominic Raab reflecting on the agreement shortly to be voted on in Parliament. So how did the Government lose its way? Historians will come to write the story of how Lancaster House morphed into present Government policy. 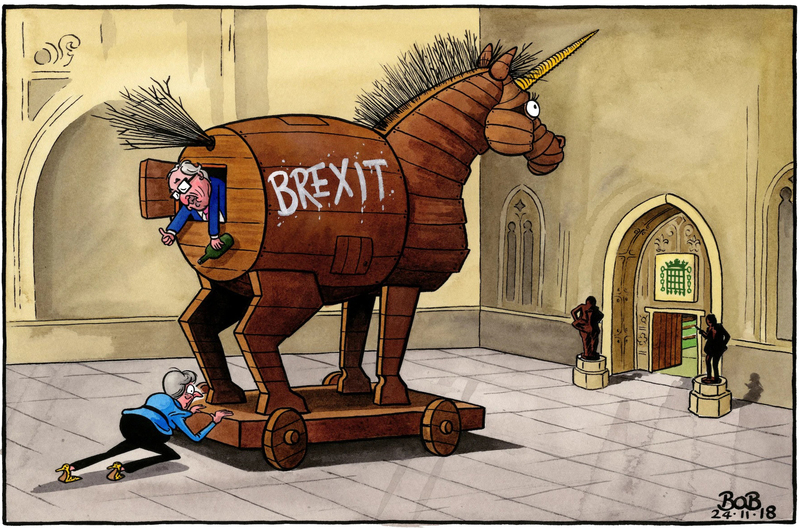 It will be a story of the inflexibility of European Union leaders, the botched 2017 General Election, and the tin ear of British political leadership to understand the electorate. By leaving most of the negotiations to civil servants, any semblance of political sensitivity was lost. And voices in Cabinet argued that business leaders wanted no change to the present customs arrangements without any regard to the trade advantages of leaving the Customs Union. Before becoming an MP, I was in business exporting to 48 countries around the globe. I can see an opportunity when it stares me in the face. It made a Brexiteer out of me before the word was invented. But I also became a Brexiteer to save my Party. And this now is in the gravest peril. I helped run our by-elections from 2007 until 2013 latterly as Vice Chairman for Campaigns. After the Eastleigh by-election when UKIP won 28% of the vote and came a close second to the Liberal Democrats who won, I told David Cameron that unless the European question was neutralised, we would never be able to form a Government. UKIP, or a similar party, would always shave 6-10% off Conservative votes in our marginal seats. Theresa May still recognises this. 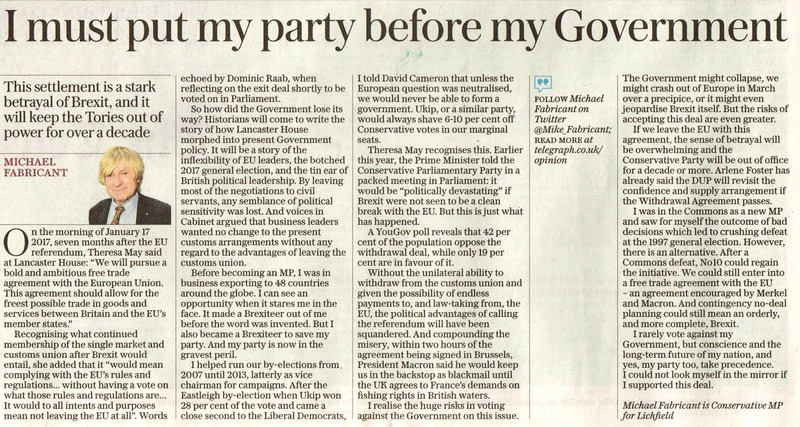 As recently as earlier this year, the Prime Minister told the Conservative Parliamentary Party in a packed meeting in Parliament: it would be “politically devastating” if Brexit were not seen to be a clean break with the EU after Brexit. But this is just what has happened. A YouGov poll reveals that 42% of the population oppose the deal while only 19% are in favour of it. Without the unilateral ability to withdraw from the Customs Union and the possibility of endless payments to the EU and law-taking from the EU, the political advantages for calling the Referendum will have been squandered. And compounding the misery, within two hours of the Agreement being signed in Brussels, President Macron said he would keep us in the Customs Union backstop as blackmail until the UK agrees to France’s demands on fishing rights in British waters. I realise the huge risks in voting against the Government on this issue. The Government might collapse, we might crash out of Europe in March over a precipice, or it might even jeopardise Brexit itself. But the risks of accepting this deal are even greater. If we leave the EU with this Agreement, the sense of betrayal will be overwhelming and the Conservative Party will be out of office for a decade or more. Arlene Foster has already said the DUP will revisit the Confidence and Supply Arrangement if the Withdrawal Agreement passes. I was in the Commons as a new MP and saw for myself the outcome of bad decisions which lead to crushing defeat at the 1997 General Election. However, there is an alternative. After a Commons defeat, No10 could regain the initiative. We could still enter into a Free Trade Agreement with the EU – an agreement encouraged by Merkel and Macron. And contingency no-deal planning could still mean an orderly, and more complete, Brexit. I rarely vote against my Government, but conscience and the long-term future of my nation, and yes my Party too, take precedence. I could not look myself in the mirror if I did otherwise.